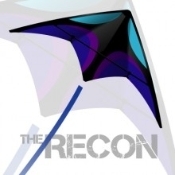 As a standard for entry level sport kites, the RECON delivers margins and performance. Igniting the passion of flight, the RECON provides thrill seekers with an affordable introduction to the action and excitement of sport kiting. With speed and responsiveness, this kite will test your reflexes, build muscle memory, accuracy and confidence. It also features a virtually indestructible nose piece and a forgiving fiberglass frame to keep high impact crash breakage to a minimum. An excellent kite that includes line on handles, nylon bag, and a tail.